Should Trump promote a third wave of American suburbanization? What President-elect Trump has the opportunity to do now is to launch a third great wave of suburbanization, one that can revive the American Dream for the Millennial generation, produce jobs and wealth that can power the American economy, and take advantage of changing technology to create a new wave of optimism and dynamism in American life. There’s a confluence of trends that make this possible. In the first place, the Millennials, like the Boomers, are a large generation that needs both jobs and affordable homes. Second, the shale revolution means that energy in the United States will likely be relatively abundant and cheap for the foreseeable future. Third, both financial markets and the real economy have recovered from the shock of the financial crisis, and, whatever hiccups and upsets may come their way, are now ready for sustained expansion. Fourth, revolutions in technology (self-driving cars and the internet) make it possible for people to build a third ring of suburbs even farther out from the central cities, where land prices are still low and houses can be affordably built. For national politicians, this is a huge opportunity. Creating the infrastructure for the third suburban wave—new highways, ring roads and the rest of it for another suburban expansion—will create enormous numbers of jobs. The opportunity for cheap housing in leafy places will allow millions of young people to get a piece of the American Dream. Funding the construction of this infrastructure and these homes gives Wall Street an opportunity to make a lot of money in ways that don’t drive the rest of the country crazy. This approach meshes very well both with the President-elect’s economic instincts and with the economic interests of the people who voted for him. It also works for the Republican dominated states around the country. It capitalizes on one of America’s distinctive advantages: less densely-populated than other advanced countries, the United States has the elbow room for a new suburban wave. There are all sorts of fascinating things going on with this argument. Let’s just pick out a few. To start, this argument suggests Eisenhower and Reagan were great because they helped make the suburbs happen. How much did they do in this regard? By the early 1950s, suburbanization was well underway with a postwar housing shortage and lots of developers and local officials interested in building out. The Federal Highway Act of 1956 certainly helped the process and is often credited for helping urban residents flee cities (even though highways were already under construction in many places). This is a good example of presidents getting credit for things that don’t have much direct control over. Second, this equates Republicans with suburbs. There are certainly patterns here: suburbanites have tended to vote Republican for a long time (particularly the further out one gets) and both Republicans and Democrats have argued more sprawl leads to more Republicans. At the same time, not every conservative loves suburbs nor does every Democrat love cities. If you had to summarize Republicanism since World War II, would suburbs come to mind or other things? Third, it sounds like this argument is in favor of government spending to promote a certain way of life. In other words, the federal government should subsidize more suburban growth because it helps generate jobs and housing. While this may fit older images of moderate Republicans (Eisenhower was one, Reagan not so much), it doesn’t fit well with more libertarian/small government Republicans. Why should the government promote certain ways of life? To conclude, it is clear that all of this requires an optimistic view of suburban life. It is the fulfillment of the American Dream. This is a common American image. Does it match all of reality? Are the suburbs open to all? Would the new spending even further from cities open new opportunities for non-whites, immigrants, and the lower class (who are increasingly in the suburbs) or would it allow whiter, wealthier residents to flee even further from urban problems? What are the environmental costs of another ring of suburbia? What does it do to civic life to continue to promote automobile driven culture (even if those self-driving cars are safer and more environmentally friendly)? These are not easy questions to answer even if many Americans would enjoy a third wave of suburbanization. In other words, it’s a classic case for big-government uniformity. Faced with these bills, Democrats in turn tend to make a strikingly conservative argument: Local people know best, and they ought to have the right to make their own rules about how they live, as long as it isn’t negatively affecting their neighbors. Local control is very important to many Americans, particularly if you have some means to get to a community where you can have a voice or be assured that local government generally agrees with what you want. Let’s be honest: both parties today are willing to forgo some (most?) principles if it means that they can use their particular tool of power to get what they want. Opposed to executive power when your party is out of the presidency? Just argue your interests are too important when your party is in office. Control Congress while another branch isn’t doing what you want? Try to bypass their power and/or limit their abilities. This leads to a rhetorical question: how well can these levels of government or different branches work together to get things done if the primary goal is just to exert power? With disquieting predictability, 10,013 adults — respondents in the largest survey the Pew Research Center has ever conducted on political attitudes — answered according to their ideology. 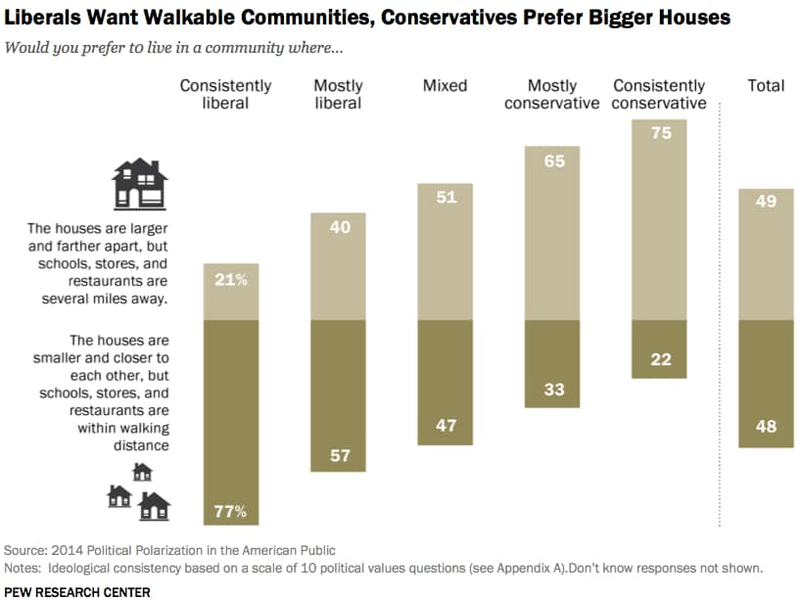 Seventy-seven percent of “consistently liberal” adults went with what sounded like the urban milieu: the dense neighborhood, the compact home, the “walkability.” Fully seventy-five percent of “consistently conservative” adults went with the polar opposite. “It is an enduring stereotype – conservatives prefer suburban McMansions while liberals like urban enclaves – but one that is grounded in reality,” Pew concluded in the report released today. This is corroborated by other data: Democrats are centered in cities, Republicans in exurbs and more rural areas, and the parties fight over suburban votes. 1. The first question describing more spread out areas versus cities is a double- or triple-barreled question that supposedly contrasts more suburban versus more urban areas. Maybe. Take the larger or smaller house part of the question. Plenty of wealthier urban residents own single-family homes or large condos or apartments – but these neighborhoods aren’t going to be as sprawling as many urban neighborhoods. But, even there, you would get some big differences between denser cities – the Northeast, Midwest, San Francisco – versus more sprawling city neighborhoods in places like Los Angeles, Houston, Atlanta, and other Sunbelt locations. 2. In the second chart, the real difference between conservatives and liberals is not that they have different opinions about suburbs: that holds relatively steady at around 20%. The bigger differences are between preferring cities versus small towns or rural areas. I’ve seen enough other data about small towns on surveys to think that there is quite a bit of overlap between suburbs and small towns. In other words, they are not mutually exclusive categories. Even some rural areas might still be suburbs, depending on their location within a metropolitan region or their proximity from the big city. All together then, the suggestion that it is suburban McMansions versus cities is a bit misleading. Adding the label McMansion gets the point across about larger houses but it also adds a pejorative element to the mix.